Will data ‘in the cloud’ survive as long as that on paper? 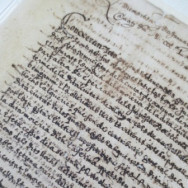 Archivist Isaies Blesa of the city archives in Xativa, the city that introduced Europe to the art of papermaking in medieval times, poses an interesting question. Will data in the cloud survive as long as that on paper? Without showing any judgment, he goes on to tell us enthusiastically about the value of paper throughout the centuries. From a bookcase, Mr Blesa takes books which are pieces of art in themselves, because of the way they’ve been bound. Pieces of paper from the 14th century describing the social life at the time. Rights and duties. And the taxes for the king. He shows the paper’s structure from different sheets, which is interesting because readability improved so much over such a short period of time.